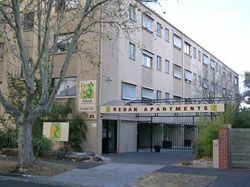 3.0 star rated Apartments located in St Kilda East Melbourne, Victoria. Alrae is in the residential area of cosmopolitan St Kilda, in a quiet, tree-lined street. Newly refurbished old world style with ornate ceilings, it offers specialty breakfasts, deemed universally popular, with attention to dietary variations.